Detour map. Click image to enlarge. THE Bridgewater Bridge will be closed for night works this Saturday and Sunday to allow for maintenance on the deck which cannot be carried out while the bridge is carrying traffic. FROM 7.30pm on Sunday, April 2, reopening at 6am Monday, 3 April. 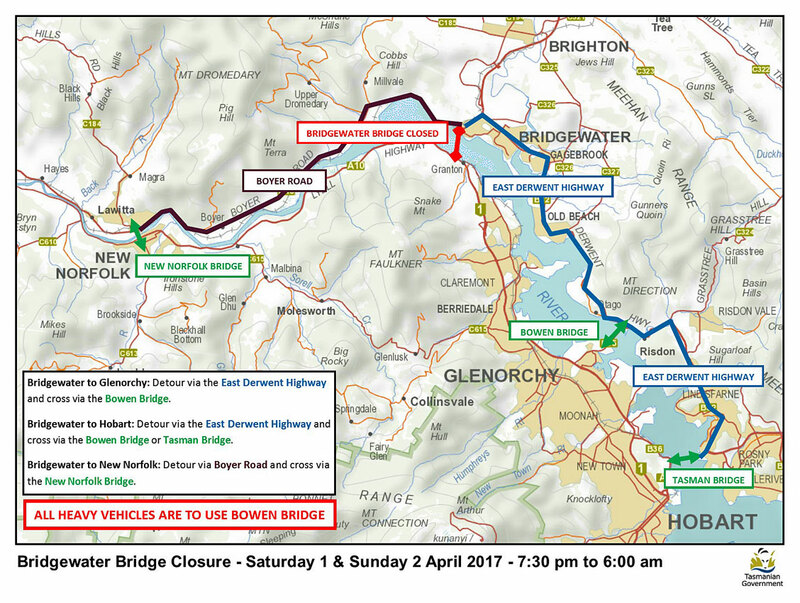 During these closures, all traffic will need to detour, and motorists are encouraged to allow extra time for their journey. 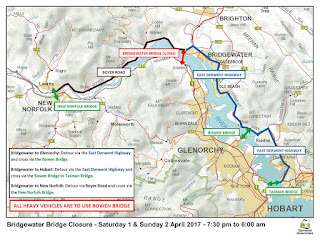 Alternative routes between the eastern and western shores are available via the New Norfolk, Bowen and Tasman bridges. These works are essential maintenance to joints on the bridge deck which cannot be completed while the bridge is carrying traffic. Conducting the works at night over the weekend is intended to minimise the impact to the travelling public.